Color Wheel - The Chip's Challenge Wiki - The Chip's Challenge Database that anyone can edit! Push a block across the blue button. Brown buttons connect vertically. Color Wheel is the 135th level in Chip's Challenge Level Pack 3. It was created by David Stolp. 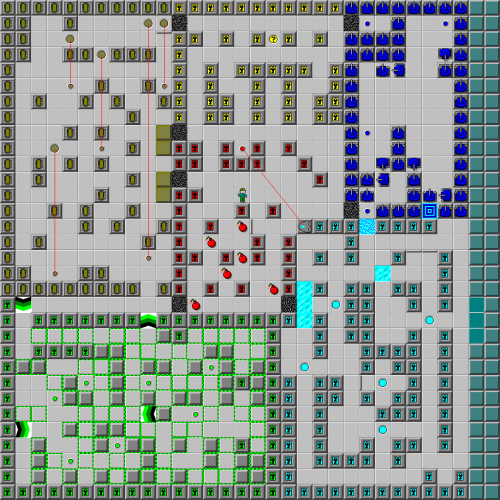 699 route: As the hint suggests, the aim is to push a block across the top-left blue button. In order to do this, it is necessary to move all 4 blocks through the level. Start by moving block 4 to 2R of the lower gravel, then clone 6 gliders. Move block 4 4R D L  2L 2D  D R 2D R (all bar 2 bombs should now be exploded). Move block 2 to 3R 3D from the lower gravel, then move block 3 to 2R of the lower gravel. Wait for both remaining gliders to hit this block – they should explode the remaining bombs. Now push block 4 through the teleport part – push it to the right as far as possible, then push it up, then follow the block until it is 2R of teleport 2. The walls here are fake, allowing the block to be pushed through teleport 2 and towards the left side of the level. Push the block to 3D from the top-left force floor, flip the walls, push the block 3D * 2D RU 5R * * 5U (* = press a green button, * * = press buttons on either side of the block, allowing access to the right side of the block). Leave the block here and return to the centre. Bring the next block through the teleports and leave it 3D from the force floor. Push the first block R U, flip the walls, then push it onto trap button 5. Move the other block through the maze (leaving it D L from the force floor). Push the next block through the teleports, and push the second block to 2U from the force floor (in the ‘door’ to the top left room). Push the third block through the maze, then push the second block onto trap button 3. Push the final block through the teleports, then push the third block onto trap button 1. Push block 4 through the maze and through trap 3, leaving it immediately above trap 4. Move the block on trap button 1 to one space above trap button 2. Push the top block onto trap 1 and the other block D onto trap button 2. Move the block on trap button 3 onto trap button 4, allowing the top block to be pushed across the blue button. The two presses of the blue button in immediate succession cause the bottom-left tank to drown, allowing entry into the final room. Push the first button twice, then the next button 3 times, opening up the exit. This page was last edited on 13 March 2019, at 01:28.